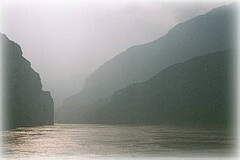 The Three Gorges Dam on the Yangtze River in China is the World’s largest dam, largest Hydro-electric project, and one of the largest construction projects ever. This power station generates an incredible 22.5GW of electricity from its 32 700MW hydro turbines – equivalent to the output from 22 typical coal power stations (50 million tons of coal), or the power used by four cities the size of Los Angeles. In units of electricity that is a total of around 100 billion kWh per year (worth around £5bn per year at UK retail prices). Approximately 3% of China’s vast power needs are met by the hydropower plant reducing carbon monoxide emissions by over 10,000 tons per year in a country where 80% of power is currently generated by burning coal. China is also the world’s second largest consumer of oil, so they are looking to reduce their dependence on fossil fuels with more mega dam hydro projects, wind turbines, and solar power. 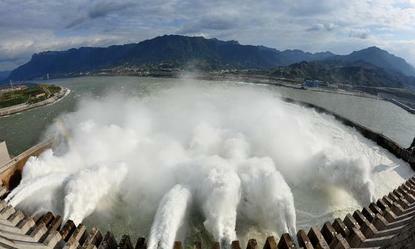 The dam has created an artificial reservoir 660km long which caused the flooding of 632 square kilometers of land. This has displaced 1.3 million people and destroyed over 1,000 towns and villages. 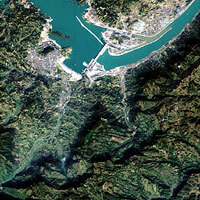 Pictured above is an image of the Three Gorges region before the construction of the dam. The total cost of the project was claimed to be under $25 billion, however real costs were believed to have been as much $100 billion by mid-2012 when the project was officially completed. The dam itself is over 1.4 miles long and 185 metres high and is constructed from 25 million cubic metres of concrete, and over 450,000 tonnes of steel. Although hydropower is seen by most to be good for the environment thanks to its ability to reduce our dependence on fossil fuels, there are now concerns that hydro electricity generation contributes to global warming, and may in many cases lead to more climate change than coal power stations. 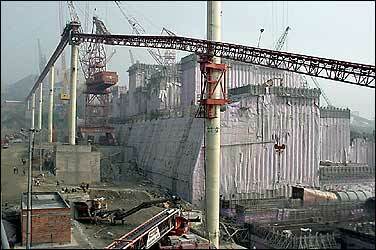 Here is an excellent documentary about the Three Gorges Dam, its design, and its construction.